I first met Heinz Pagels when he came to Rockefeller University in 1966 just after getting his PhD from Stanford. I was then a visiting professor at Rockefeller and I attended the first seminar he gave there. He struck me as a golden boy–handsome, very gifted and a little naïve. But I only got to know Heinz in Aspen. After my first couple of visits I developed a modus operandi. I applied to come for the month of June and then I would spend most of the rest of the summer in Europe. There were several reasons why I chose June. It was the off–season in town. The music did not begin until the end of the month. I liked the peace and quiet. It was also something like the off–season at the Center. The months of July and August were the most requested and as the Center became more and more popular they were the most difficult times to be accepted. Not too many people wanted to come in June. I also liked the snow. The high country was still snow–bound. In some of the places I hiked there were no tracks. I remember being in a high snow–bound valley and seeing a mountain lion across the way. It must have spotted me because it took off with leaps and bounds. Heinz joined a group of us who hiked or climbed every week. He was a natural and seemed to bound along like a gazelle. Sometimes the two of us went out alone and talked endlessly about everything. It was inevitable with his genius for friendship and organizational ability that he would be asked to become part of the governance of the Center. On one of our hikes he asked me if I would also like to play a part. I said that I would and thus began a many–year role in the affairs of the Center. I eventually became a vice–president of the Physics Center and got to spend more time in Aspen. For a couple of summers Heinz and I shared an office. This brings me to the summer of 1988. Early in the summer a group of us made a straightforward climb to a peak on the Continental Divide from which there was a spectacular view. Heinz proposed that we go down a different way from the one we had used going up. I was not enthusiastic about trying novel down routes that none of us had been on. But it looked like it might be all right. At first it was easy but then we hit a bit of nasty rock climbing and I was glad when we got back on a broad ridge. The route to the meadows below was straightforward and we were able to pick up a trail. I was walking along when suddenly I saw Heinz on the ground. Somehow his leg had given out and he had fallen. It seems at some point in his childhood he had had polio and this had left him with a weakness in his leg. I took a look at his boots and they were awful–very badly worn and bent out of shape by pronation. I commented on this and he explained how comfortable they were and he got up and loped off as before. We did a few more hikes and on Saturday, July 23, he told me that he was going to take his former student at Rockefeller, Seth Lloyd, up Pyramid Peak. 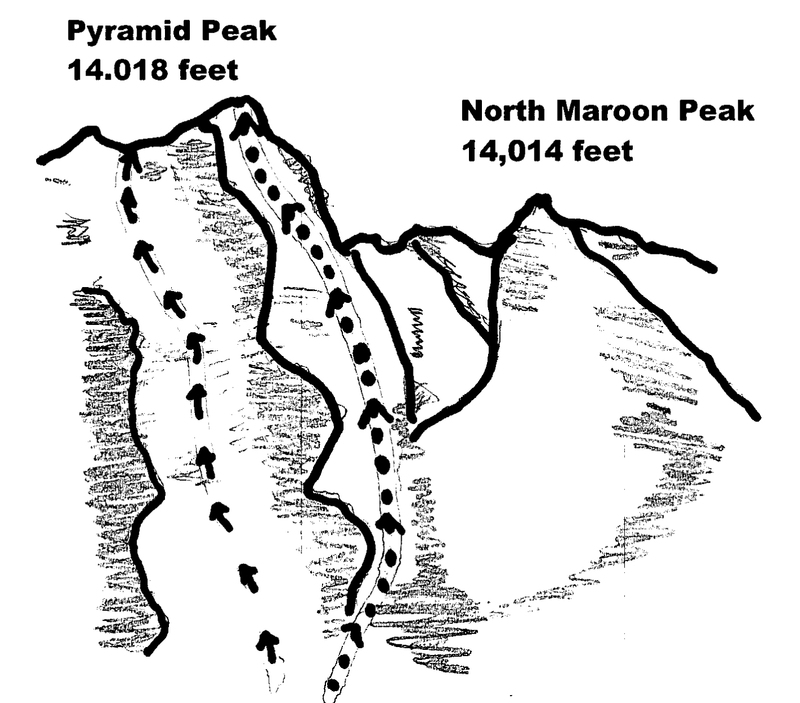 Pyramid Peak is a high and potentially dangerous peak a few miles from Aspen. The danger lies in the loose rock which can fall on you and anyone below you and which you cannot count on for solid holds. A colleague and I had climbed Pyramid with Heinz the year before. We took the easier of the two routes, the one on the right in the drawing. At one point there is a step that takes you over the north face. It occurred to me that this was one place on the route where a fall would be absolutely fatal. Heinz wanted to take Lloyd on a traverse of the mountain going up the left–hand route, over the top and down the way we had gone up. They completed the first part of the climb and were on their way down with Pagels in the lead. At just this spot he fell. I can only imagine that his leg must have given way again. Lloyd raced down the mountain to get help but Pagels was killed in the fall. I learned about this when Pagels's wife, Elaine, called that afternoon to tell me. I was stunned. The only thing I could think to do was to call Sally Hume Mencimer. Not only was Sally our administrator but she was also a friend of all the physicists. She was the only person I could think of who could help in this time of grief and she did by going to Elaine and offering what comfort she could. The news of Pagels's death was devastating. He was only forty–nine. In addition to his wife Elaine, there were two young children. His son Mark, who had been born with a congenital heart condition, had died at age six the year before. But at the time of his death Pagels had an international reputation. He had written three very successful popular science books. The last of these, The Dreams of Reason, he had dedicated to his dead son. He had left Rockefeller to become the chief operating officer of the New York Academy of Sciences, a moribund institution which he had revived. It seemed clear that he was headed in the direction of running a great foundation or becoming the president of a university. The accident just broke your heart. At the Center we debated as to the best way to honor his memory. We finally decided that given his interests in the public understanding of science the most appropriate thing would be to name a lecture series in his honor. The Center had already been giving public lectures. In Chapter III, I noted that in 1969 Bethe gave a lecture on the proposed anti–ballistic missile systems. But our lectures were not under any special rubric. The summer of Pagels's death, before the new lecture series was organized, we had offered five public lectures on subjects that ranged from high temperature superconductivity to superstrings, the latter given by the future Nobelist David Gross. But we wanted the Pagels series, which began in 1989, to be a little different. The first lecturer in the series, which was on July 5, was Stephen Hawking. The presence of Hawking at the Center presented certain minor logistic problems. He traveled with a small retinue including an assistant and a nurse. He had a wheel chair and a voice synthesizer, which operated by spelling things out on a computer. His office was next to mine but apart from smiling I did not try to have a conversation. However, he was an icon and people with handicaps from all over the region tried to contact him. The lecture “Black Holes and Their Children, Baby Universes,” had been pre–recorded on the synthesizer. To say it was a success grossly understates the case. We could not fit the people into Paepcke Auditorium. It was filmed and made available on television. What surprised me about it was how funny he was. Of self–pity there was none. Hawking's lecture set a standard of public interest that was impossible to maintain. But we tried. There were some physics lectures and I gave a lecture on trekking in Bhutan. This, of course, had nothing to do with physics but I thought that it was something that Pagels would have liked. I began my lecture by telling a story about Pagels that I think showed why he was such a lovable character. My writing career had begun before his and at some point the Book of the Month Club was going to feature one of my books. I was then in Aspen. They needed a picture of me. They agreed to send a photographer from Denver. He arrived at the appointed time, about 9 am, and was sent to the office I shared with Pagels. I was not yet there so Pagels told the photographer that he was me. When I arrived Pagels was outside posing for pictures. I attempted to explain the mistake and was not helped when Pagels said to the photographer, “He has days like that.” I finally had to show my drivers license to the photographer, who was not amused. The lectures played another role. Compared to the Institute and the music people, we kept a pretty low profile. All anyone saw were a few physics professors riding on bicycles or hiking in the mountains. Our seminars were not announced in town and were not open to the public. A couple of times a summer we gave a cocktail party to which a few of the locals were invited. That was about it for town/gown relations except for the fact that we rented a great many accommodations. The Institute also rented housing in town as did the music people, who only later would have a small campus outside of town for housing its students. The music students and faculty gave many public concerts during the summer. We had been quite content with our invisibility until it became clear that we might lose the land on which we had been operating, and we realized we were something of an unknown to many locals. Public lectures gave us visibility. To understand the sequence of events that ensued it is useful to refer to the geography. On the map below the Physics Center is located at Sixth and Gillespie Streets. To the north are the music tent in which concerts and special events like Stephen Hawkings' lecture are presented, and other buildings that the Institute uses for its programs, including an auditorium. To the west is the Aspen Meadows where Institute visitors are housed. Between the Physics Center and the Meadows there is an open sward about the size of a football field, which was known as the “riding ring” or “race track.” There is a fairly wide dirt path around the perimeter of the track, which apparently was once used to ride or race horses. By the time the Center was founded it was a jogging path and a good place to walk dogs. New activity at the Institute was to take place at the Meadows and environs. The Physics Center was not directly involved or so it seemed. In Aspen, making changes to land use is a very complex business. There is what is known as the Planning and Zoning Commission. It is a seven–member volunteer body that is appointed for four–year terms by the Aspen City Council. It recommends to the Council whether or not a land–use application should be approved. In the winters of 1978 and 1979, representatives of the Institute appeared before the Commission to present their new plans. There were to be 245 guest rooms, 18 new townhouses for Institute faculty along with the 61 townhouses and guest rooms that were already there. In addition there would be 50 employee housing units. The Institute owned 125 acres of land, which of course included the Physics Center and the music tent. These new facilities were going to be built on the 26 acres at the Meadows, which is marked in the large green area in the map below. 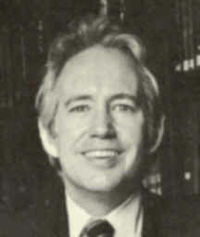 A back–and–forth continued throughout the spring of 1980. It seemed that a compromise had been reached in which the Institute agreed to rent out only forty percent of its rooms at any time for transient use. But on June 19 the Aspen Times reported a rumor, which was confirmed a few days later, that all the Institute property in Aspen had been sold to a local developer named Hans Cantrup. He had an interesting history. He was born in Berlin, Germany in 1929 and in 1950 came as an exchange student to Syracuse University where he studied business administration. In 1954 he came to Aspen to ski and paid for his lift tickets by waiting tables at a local restaurant. He decided that Aspen had a future as a tourist destination but that it lacked accommodations. No bank would lend him any money to build lodging, so he borrowed enough from some ranchers to build the fourteen–room Smuggler Motel in 1955. 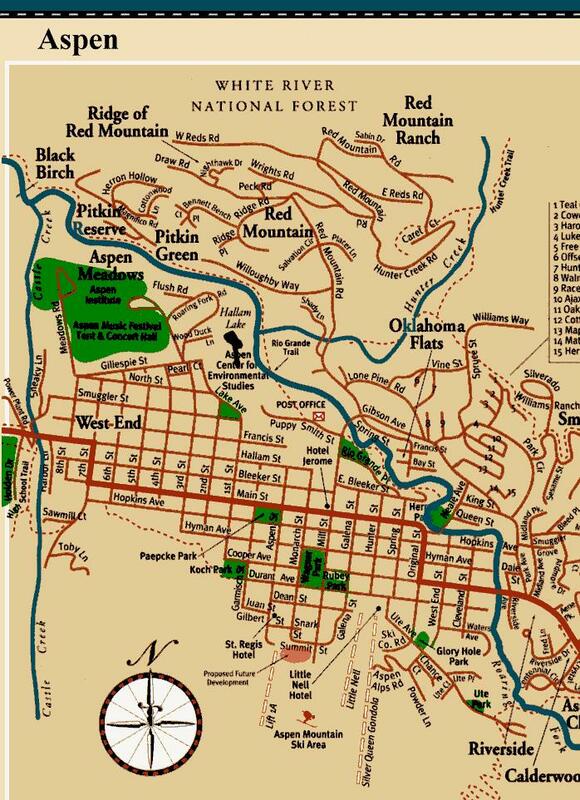 By 1980 he was the largest landowner in Aspen with properties all over town. In the fall of 1979 he paid $2 million in cash to buy 300 acres of mining claims at the base of Aspen Mountain. He had no intention of looking for silver but rather wanted to build a luxury hotel. At the present time there is a string of luxury hotels at the base of Aspen Mountain, but at the time it was largely open space. Cantrup had a soft spot for music students who came to Aspen in the summer and rented places for them to live at less than the going rates. What Cantrup actually bought was all the shares in something called the Meadows Corporation, a subsidiary of the Institute since 1977. He paid $5 million for the shares and assumed a $900,000 debt. The Institute had been running at an annual deficit which was as high as $750,000 and for 24 years Anderson had been covering it and had now stopped. In addition to these payments, Cantrup assumed a debt of $3 million which had to be paid back in five years, otherwise the property was to be returned to the Institute. As we shall see, this is what happened. But in this moment of euphoria, Cantrup said he would give the Music Associates the land they needed. Of the Physics Center nothing was mentioned. Most of the physicists that summer had no idea of what was happening. One of the topics they were discussing was quasars. By this time astronomy had arrived in full force at the Center.